EDITORIAL A PARDON FOR DUVALIER CRIMES THAT DO NOT EXIST? I HOPE NOT!! 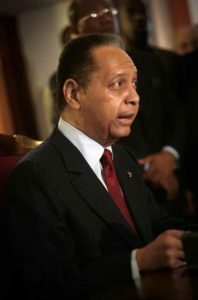 EDITORIAL;The court system in Haiti has arrived at a point in time where it must, and I repeat MUST, give Jean-Claude Duvalier a clean bill of health. In actual fact, he is not guilty of any crimes against humanity, or inhumanity. He is not guilty of corruption to any degree greater than the average American president, or Member of Congress… or businessman. In other words, even if the crimes he is accused of, weren’t already Statute Barred he would not be convicted if taken to court. However, Aristide and Preval, plus many of their associates, are guilty of murder, kidnap, and corruption on a massive scale. They should both be indicted in the American court system for trial on cocaine charges in the USA. France is now pressing for action against Aristide and Preval. The balloon is about to burst and there is panic in the Aristide/Preval camps. Once the landslide starts…many will be swept away in the flood that follows. Lavalas will be drowned. After the French demanded…asked for…or requested the right to interrogate Aristide and Preval, there was a panic. When they press for Aristide’s extradition, there is fear, real fear based upon the knowledge of secrets held by Amaral Duclona…secrets he has revealed to the French government. There was an immediate contact with Martelly people to negotiate a pardon for any and all crimes that were committed between 1990 and 2005. Millions of dollars have been offered for the action. How does Martelly, and his team, make this possible without upsetting the public. Their answer is a simple one. Pardon everyone….using Jean-Claude Duvalier’s pardon as the door-opener. Once Duvalier is pardoned it will be a simple step for Martelly to forget his campaign promise to reveal the fate of $198,000,000 in Petro Caribe Funds….and pardon the guilty. His recent press conference gives the first hint. The truth lies in a much simpler solution. You cannot have reconciliation unless someone pay their debts to society. Otherwise we are just going to experience the ongoing IMPUNITY of the past. YOU CANNOT PARDON SOMEONE UNTIL THEY HAVE BEEN CONVICTED.